Home > Blog > How to config DDNS on TCW210-TH, TCW220, and TCW241. This article outlines the necessary configuration steps, the implementation of which will allow the user to have remote access to TCW210-TH, TCW220, and TCW241 Ethernet controllers. The document looks at three operators (DynDNS, No-IP, and DNS-O-Matic) that offer a DDNS service. DDNS or DynDNS stands for Dynamic Domain Name System. In other words, DDNS dynamically maps a domain name to an IP address. This service lets you access your devices from the Cloud. When a user wants to provide access to a service or content (web page, file server) to other users and does not have a static IP address provided by its ISP, it can use an operator who provides a dynamic DNS service. 1. Register an account in the system of the selected DDNS operator. 2. Create a record in the operator’s system that contains the name and IP address of the server (web, file). – If the device does not support such a feature, DDNS service providers offer software that will send updated information. 4. To set the own router to forward the traffic (Port Forwarding) to the device. At this point, the three operators and the information needed to create an account in their system are presented. To create an account use this link: https://www.noip.com/sign-up. The user should provide the following information – email, username, password, and hostname. The chosen hostname is editable after the account is created. For registration follow this link: https://account.dyn.com/entrance/. For the registration, the user needs to enter an email, username, password. Since this is a paid operator, it is necessary to pay for the user selected plan after the account is created in order for the service to be available. DNS-O-Matic is a platform that allows users to update their dynamic IP address information to multiple operators simultaneously. The platform itself does not offer a dynamic DNS service. Registration to this system can be made via this link: https://dnsomatic.com/account/. For the registration, the user needs to enter an email, username, password. Creating a host to each operator requires the user to enter a hostname to which the domain name of the respective operator and the IP address of the device will be added. For example, this article uses the mytcwcontroller name for hostname and IP address set by default to the controllers – 192.168.1.2. When creating a real hostname, its name should be unique. In order for a host to be added to the No-IP operator system, once the user has logged into his / her account, the My Account option must be selected from the menu. From the navigation menu, select Dynamic DNS> Hostnames. From the open page, select the Add Hostname option. Here, the host will request host information – name, domain, and IP address. The user should confirm the host every 30 days for free plan. No-IP operator offers a paid and free service. In order to add a host, the user should log into his / her account, and choose My Services submenu. From the open page in the Host Services column, select Add Hostname. Here, the host will request host information – name, domain, and IP address. The user should arrange the payment for the selected plan before to continue using the service. To add a record to this platform, select Add Service option when you logged on. 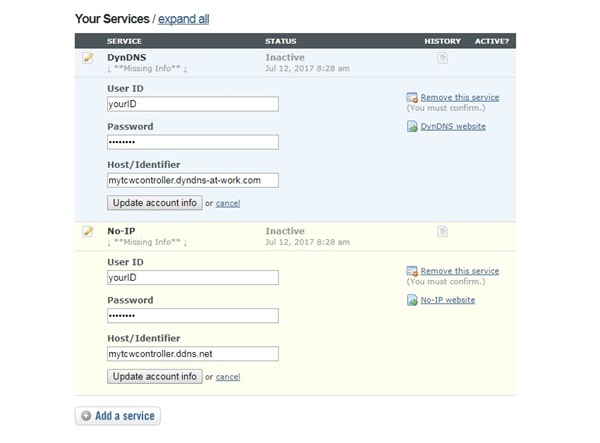 In the loaded form, the user must select the DDNS service provider which want to add to the account. Depending on the selected operator, the user should supply a different information. In general – user account information in the selected operator (account name and password) and hostname (host ID) or host token name. For the purpose of the article, in the User ID field, the username is yourID, while for the hostname – mytcwcontroller. 1. Select the Services option from the main menu. 2. 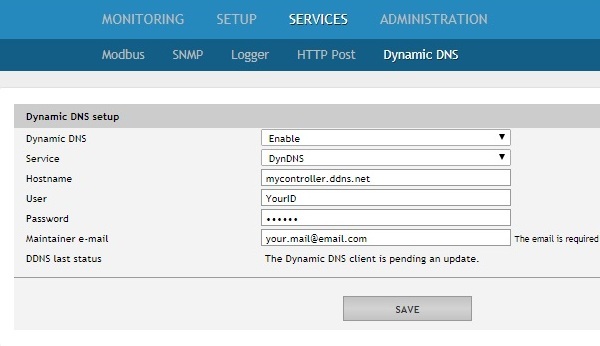 Select the Dynamic DNS option from the Services submenu. – Maintainer e-mail field – the user’s email address. 4. Save the created configuration. For all three devices the setting is the same. It is essential for the user to set conditions in the router to redirect the desired traffic to the corresponding IP address. Because each router manufacturer uses a different menu, the port forwarding option may be named differently, but it is one of the following: Port Forwarding, Virtual Server, Applications and Gaming, Forwarding. Configured this way to any of the mentioned DDNS service providers, the Ethernet controller will be available from anywhere. Upon changing the IP address of the device, it will notify the DDNS server of the operator, which in turn will respond to the updated IP address upon request by the user.